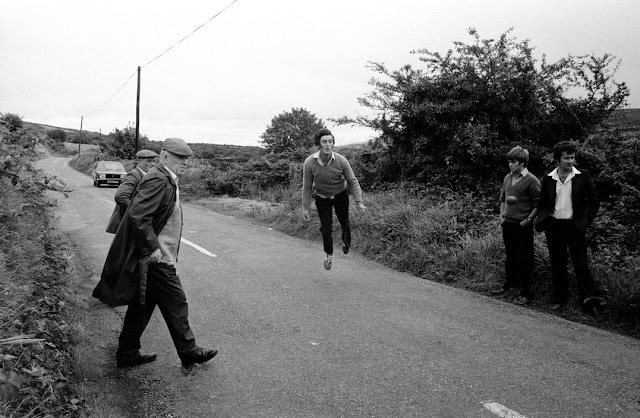 * This is something a bit different to what I have been blogging about up until now, a bit more personal and maybe very niche - but it's mostly about family, memory & the strange sport of Road Bowling, an ancient game played along country roads in Cork and Armagh - where two men take turns throwing heavy, steel balls along country lanes, competing against each other to cover the distance between two marks on the twisting roads in the shortest number of throws possible - to get an idea of what it looks like, here's some footage of a recent match in Cork - where I am originally from - you probably only have to watch the first two minutes or so to get the idea. And remember - those are solid steel spheres - about the size of a tennis ball - that they are hurling with great force and speed along those narrow, crowded roads. The wonder is, they never hit the spectators. The internet can really stop you in your tracks at times. Not too long ago, researching for a radio piece on the British Pathé newsreel archives, I came by chance on a colour film shot in Cork in 1957. And suddenly realised I was looking at the faces of my uncles as teenagers & hearing the name of a long dead grand-uncle, Timmy Delaney. It was a very strange moment. The jaunty, British Pathé commentary "You just try and stop and Irishman from gambling!" jarred with the images of the men and the sport I remember very vividly from my early childhood, days spent walking the Old Bog Road on the outskirts of the Northside of Cork City, where my father's family are from. The original Newsreel footage is below, just click play. My father's uncle was a man called Timmy Delaney, aka "The Pride of Fairhill", aka a Man You Did Not Mess With. Timmy had done some soldiering in the Tan War and then in the Civil War, on the right and then the wrong side. But we never really got the details, I just dimly remember him, as a very shrunken old man, talking about waiting outside a pub on a country road one night, using the light off the brass buttons of the soldier's uniforms to sight his Lee Enfield rifle. I have no idea if they were British or Free State soldiers. These were the kind of stories many children of my generation would have heard, or probably overheard, when ancient men of that generation were gathered together in the smoky Woodbine fug of the kitchen. By the time I was in my teens I tended to dismiss the "My Fight For Irish Freedom!" stories as tired old cant from the days of Flying Columns and the Old IRA. In any case, Timmy slipped away when were were just kids, after being bed-ridden for years. Most people tended to be very respectful of Timmy. He had been known for his volcanic temper and the fact that after the end of the Tan and Civil wars, he took a relaxed view towards decommissioning himself and his firearms. There were stories of Webley pistols produced at hurling games (the Irish sport with stick and ball), grudge-matches that had gotten out of hand. And guns waved in the faces of men who crossed him. Or took his bets and didn't much feel like paying out. Maybe legends, maybe not. The temptation is to glory in the legend of a hardman in the family. But I've never had much time for hardmen, relatives or not. So I really hadn't thought about Timmy, or the Sunday mornings after Mass trudging through the crowds of shouting men, following the bowlers (including my dad and my uncles) along damp country roads, in many years. Until I saw the British Pathe footage. In the years since, I have occasionally come across Road Bowling matches on by-roads in West Cork. And I remembered the earliest memories of being a boy amongst men. There were never any women on the road, it was for gambling, a bit of drinking (men would spirit naggins of whiskey out of various pockets with the dexterity of Close Up Magicians). It allowed the men to get away from the house and responsibilities, bond over a strange sport where heavy iron balls were slipped from palm to palm before being launched with a long, skipping, run up, windmilling arms and a moment of airborne, balletic fury just before the final release. Working men in Cork in the 1970s didn't tend to be very balletic or graceful, even on the dancefloor of the ballrooms. 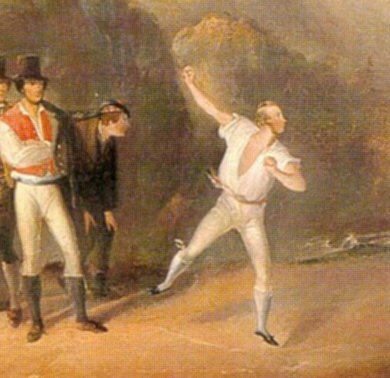 But Road Bowling, when it is done correctly (and it takes an immense amount of nimble-footwork, balance, grace and co-ordination) is almost as much Modern Dance as Sport. Think Nureyev attempting the shot-putt. The stories of how it came to be played in it's only real strongholds of Cork and Armagh (although they play in the US and Holland) tend to vary, with the best guess being that it came here with Dutch mercenary soldiers in the Williamite Wars in the 17th century. The soldiers would take the only balls they had - small cannon shot - and throw them along the road, betting their pay on who could cover a set distance with the smallest amount of throws. The fact that it is sometimes called "Bullets" - especially in Armagh, would tend to back up this theory. It's still played on the roads of West Cork and Armagh - and big matches can draw thousands of people and shut down roads for miles around. Many thousands of pounds are also bet, with the money held by hedgerow bookies. I left Cork for good when I was 17 and though I still love the place (and hope to move back there eventually) I sometimes don't feel the bonds are as strong for me as they are for many of my friends, who also left but managed to hang on to their Leeside heritage in a stronger fashion than I did. So seeing Timmy, some of my uncles and the Old Bog Road brought back many memories and made for mixed feelings. The colour footage of smiling, laughing men, back there in the grey 1950s, are frozen moments of joy in what were very hard times. I don't remember any of them being that young and that, apparently carefree. Mostly because I only knew them when they were already on the verge of middle age. Seeing them in that moment and knowing how time changed them and wore them down, it's incredibly poignant.